We are a friendly, Bible-believing, Christian church and we want to share with you, our local community. We would love to welcome our village and to meet our neighbours so why not come and join us for our first ever open day! We have made a number of changes to the building over the last few years and would like to show you what we have done (some with the help of grants from BAVO). Perhaps you have had past connections with the church. You might be new to the area or just curious. Maybe you have never been to Bethel before. Whoever you are, we would love to see you. 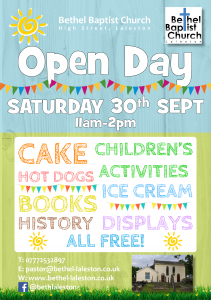 There will be free food and refreshments, games and activities for kids, information on the church’s history and current activities and just a friendly atmosphere to enjoy. In the Christian message of good news, centred on Jesus Christ, we believe we have the best news in the world and would love to share that with you. Next Next post: Soup Lunch again!